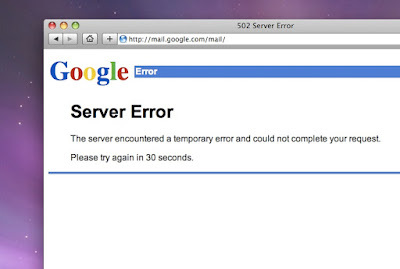 Gmail has been down for the past hour. The site either appears to load but then the user is unable to to login or the site does not load at all and a server error page is loading. Something pretty bad is happening because Google is usually able to resolve this issues (fix the problem or redirect the traffic to another cluster) in a matter of minutes, but not this time. We will have to wait and see if there is some kind of formal announcement. Update (2:37 pm): We've fixed the issue, and Gmail should be back up and running as usual. We're still investigating the root cause of this outage, and we'll share more information soon. Thanks for bearing with us. Gmail tracked the problem and posted on the Gmail Blog about the issue. Turns out it was an overload on their request servers. In other news battle.net has thrown me out from my Diablo 2 session and I cannot connect back to the game(past the game room screen that is)....what is it with today? I have been trying to access Gmail for a long time. its down since yesterday afternoon.. This is very annoying I dont understand wats happening with Gmail.